There are many similarities between the Plantronics CS530 headset and the Plantronics Voyager Legend CS headset, but the differences may be very important to you in choosing which headset to purchase. The Plantronics CS530 cordless headset and the Plantronics Voyager Legend CS cordless headset are two really good over-the-ear model headsets. Both have a one-year warranty. 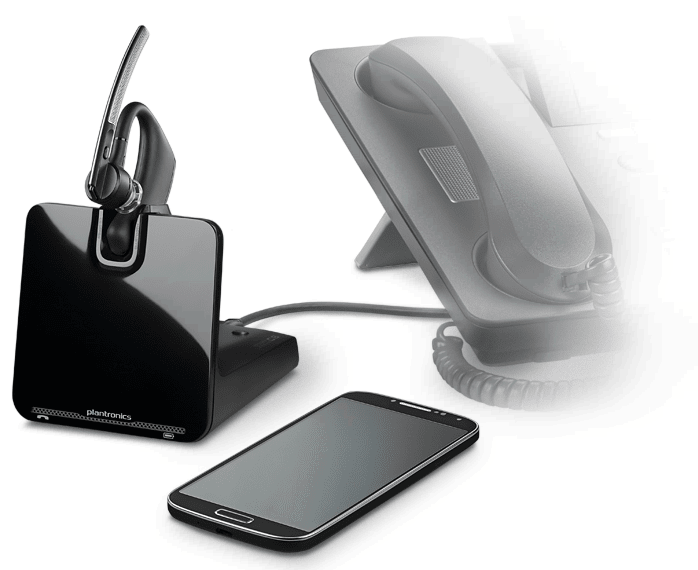 They’re made for the business world, so they are both good commercial-grade products that will plug into multi-line business phones. Let’s take a look at the Plantronics CS530 headset first. The specs on it: It’s 25 grams, so it’s very lightweight, it will give you six hours of talk time, and give you 350 feet of roaming distance using DEC technology. The technology is the biggest difference between the Plantronics CS530 and the Plantronics Voyager Legend CS. The bases for both headsets are identical. The base has a magnet that will help make sure the headset seats into the base unit. The base unit is really the brains of the whole thing. This is what has compatibility settings and volume controls. The Plantronics CS530 headset is very flexible at the top, and that makes it quick and easy to put on. It also comes with ear gels in three different sizes so you can find o that’s very comfortable. On the back you’ll find volume up and volume down settings. The Plantronics CS530 also has mute capabilities, and the silver button on the headset is your call control. This is what either turns the headset on and off, or if you buy the optional handset lifter or EHS cable, that button allows you to answer and hang up remotely. If you want to use an HL10 handset lifter or EHS cable, you will want to work with an authorized distributor to find what’s compatible for you, because there are many different variations. The hand set lifter or EHS cable allows the headset to ring in your ear giving you an indication that you have a call coming in. This is a really nice productivity booster because you’re not missing calls to voice mail and playing phone tag all day with someone. You can take calls away from your desk with the simple push of a button, and you can push the button again and it hangs up the call. So again this is the Plantronics CS530 wireless headset. Easy to put on one handed, and you are ready to go. The mic rotates up and down. As for mic positioning, you should position it at the corner of your mouth and about a quarter inch away from the edge of your mouth, that’s what gives you really good mic pickups, so your callers hear you clearly. Everything is hidden behind your ear on the Plantronics CS530 headset, so it is very low profile. So if you find yourself in a position where you’re talking to people face to face and leaving the headset on all the time, so people won’t be distracted by a big headset, all they will see is a small voice tube. As mentioned earlier the Plantronics Voyager Legend CS cordless headset uses the same base as the Plantronics CS530. The base has all your compatibility settings, it also has the magnetic dock so you know you get a good charge. Again the Plantronics Voyager Legend CS headset has the bendable, flexible top. You also have volume controls, mute capabilities, and the call control button, so you can use a handset lifter or EHS cable to answer and hang up remotely. Now the specs on the Plantronics Voyager Legend CS cordless headset — it’s 18 grams, has seven hours of talk time, its range is 33 feet, and it uses Bluetooth technology. This headset communicates to the base using Bluetooth technology, and that’s why there is a limitation of up to 33 feet roaming distance. So that’s the negative with this headset is you really have a lot less distance versus the Plantronics CS530 headset, because there you have 350 roaming feet distance. The advantage here is because its Bluetooth, this will also pair to your mobile phone so you really get a multipurpose headset here. You can use it in the office for your multi-line phone, and you can also take the Plantronics Voyager Legend CS home or on the road with you and use it on your mobile phone, so it’s really two headsets in one, meaning two applications with the same headset. And the Voyager Legend CS pairs easily with your mobile phone. I would suggest having a car charger or an AC charger to take with you if you’re using it on the road, so that way you are always charged and ready to go. It also has the different ear gels, so you can find something that’s very comfortable for you. But the big thing to really walk away with these two headsets when you’re comparing them is the technology. They are both crystal clear, secure channels, it’s just that distance factor of the Bluetooth model versus the DEC model, what you really need for a better office solution. 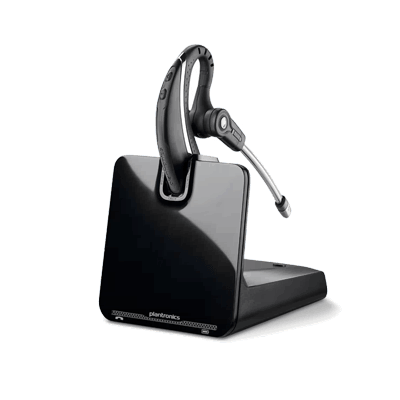 So if you need the roaming distance to really cover a larger office or a warehouse, the Plantronics CS530 cordless headset will give that to you. If you’re all right staying within your office, a typical 10 to 15 by 10 to 15 foot office, there’s where that 33-foot distance will work well, if it suits you better to have a headset that can also be a solution for your mobile phone. So again, the Plantronics CS530 cordless headset and the Plantronics Legend CS cordless headset, are both really good headsets, both over-the-ear models. You won’t go wrong with either one, it is just a matter of finding which one is a better solution for you. If you have questions on these or any other headsets, please give us a call at Headsets Direct at 1-800-914-7996 or visit us online at www.headsetsdirect.com.